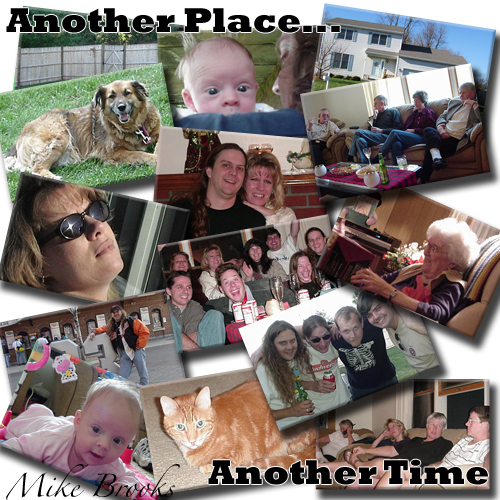 The songs on "Another Time... Another Place" represent some of the early music composed by Mike Brooks from the years 1998 through 2004. Most of this music was composed and recorded on a Korg 01W/fd. All songs copyright 1998 - 2007 Michael Brooks. Forbidden Zone - Heavy Contemporary Instrumental Synthesizer Rock with a pseudo guitar part holding it all together. Dark and Ominous. One of my personal favorites. Entropy - Stylized Synthesizer rock. Raw synth lead coupled with driving bass lines and metallic percussion. This was a very fun song to write. Mystic Lore - Imagine yourself at an ancient rune in a land that time forgot. Your feelings of wonder and awe are overshadowed only by a vague sense of unease. Perhaps the rumors were right, perhaps this place is magic. Crocagator - An upbeat pop song. Written around a funky clav line. Killian - A pop ballad. Written not about a beer, but a cat. Cloud Nine - An uncharacteristically upbeat pop song. Out on a Limb - another pop song. Simple lines combining for an interesting song. These songs were written at various times, and most just for fun. All recordings copyright Michael Brooks. Of course the songs belong to the orginal authors.